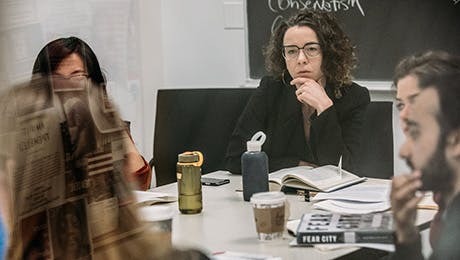 Courses in the Department of Liberal Studies survey modern society through groundbreaking thinkers and significant developments in the arts, social history, cultural theory, politics, and philosophy. Students will enhance their own ideas through nonfiction writing and criticism, improving the clarity of their thinking and analytical construction. Far from receding with the rise of liberal democracies worldwide, violence appears to be enjoying a spectacular rebound, from the wave of revolutions in North Africa and the Middle East to dramatic acts of individual terror in Norway. In this course, we explore classical theoretical propositions concerning the role of violence in bringing about social and political change, from Marx through Weber, Lenin, Gramsci, Arendt, and Benjamin to more recent thinkers like Foucault, Derrida, Zizek, and Michnik. We look at different types of political violence and their specific instances and revisit Arendt’s well-known distinction between the justifiability and the legitimacy of violence. Conscious of the traditional forms of political violence — wars, revolutions, and armed struggle movements — we pay attention to the forms and consequences of structural violence, but also examine the forms of cultural and symbolic violence, such as language that routinely serves to legitimize violence. This course focuses on the aesthetic ideas and practice of political theater in the 20th century, tracing the development of modern political theater from its origins in the didactic humanism of the Enlightenment to the formation of proletarian and popular theater in Germany, Russia, and the United States. Special attention is given to Marxist, avant-garde, and liberal democratic theories of the stage in their responses to, and artistic resolutions of, historical catastrophes and political and ideological differences during the two world wars, the Cold War, and the era of McCarthyism. This course is dedicated to the centennial of the New School. How does a writer shape his or her personal experience into work that speaks to issues of general political and social importance? In this course, we examine short pieces by a wide range of writers who have used the first person to report on current events, engage with public figures, and reflect on social or cultural phenomena. We focus particularly on the construction of narrative voice and perspective and on the ethical and aesthetic questions that arise when the author serves as a character in his or her own work. The course has a strong workshop component; students write several brief essays, and we spend part of each meeting discussing effective examples of student work. The course presents an interpretation and an evaluation of the fate of modernity, as understood by some of the most influential thinkers of the past 250 years — and involving different currents in the arts, social history, cultural theory, politics, and philosophy. "Modernity" is understood here to entail such phenomena as the emergence of the nation-state, ambitious claims for the authority of reason in human affairs, the increasing authority of the natural sciences, the advent of a discourse of natural or human rights, aesthetic modernism, capitalism and the free market, and globalization and social movements that take up new demands of mutuality, from feminism to the labor movement. Pessimism has a strange status in Western culture. Often overly morose, antagonistic, and resigned to failure, pessimism is a philosophical position that is frequently dismissed as simply a "bad attitude." Indeed, some of the great pessimist philosophers (most notably Schopenhauer) also excelled at being curmudgeonly and generally grumpy. Other pessimists (such as Nietzsche) argue that pessimism, when pushed far enough, must become a kind of optimism. As a philosophy, pessimism is also characterized by its stylistic quirks — pessimist writings most often eschew systematic philosophy in favor of the aphorism, the fragment, the observation, even prose poetry. Indeed, many works in the pessimistic vein straddle the space between philosophy and literature. This seminar will engage with key works in the pessimist tradition, noting pessimism’s always tenuous relation to philosophy.